Attempting to ram U-33 during the First World War and being executed for that act. Charles Algernon Fryatt (2 December 1872 – 27 July 1916) was a British mariner who was executed by the Germans for attempting to ram a U-boat in 1915. When his ship, the SS Brussels, was captured off the Netherlands in 1916, he was court-martialled and sentenced to death although he was a civilian non-combatant. International outrage followed his execution near Bruges, Belgium. In 1919, his body was reburied with full honours in the United Kingdom. Fryatt was born on 2 December 1872 in Southampton, the son of Charles and Mary Fryatt. He attended Freemantle School in the late 1870s. In 1881, Fryatt's family lived at 22 Trinity Terrace, in St Mary's, Southampton, but later moved to Harwich, Essex where he attended the Corporation School. He and his wife, Ethel, had seven children; six girls and one boy. The children were Olive, Victoria, Doris, Vera, Mabel, Charles and Dorothy. The younger Charles later followed his father into the merchant navy, training at HMS Worcester. On leaving school, Fryatt entered the Mercantile Marine, serving on SS County Antrim, SS Ellenbank, SS Marmion and SS Harrogate. In 1892, Fryatt joined the Great Eastern Railway as a seaman on SS Ipswich. Fryatt's father had been the First Officer on SS Cambridge. Fryatt rose through the ranks, serving on various ships. His first command was SS Colchester. In 1913, he was appointed master of SS Newmarket. On 3 March 1915, Fryatt's command, SS Wrexham, a Great Central Railway ship, was attacked by a German U-boat. The ship was chased for 40 nautical miles (74 km). With deckhands assisting the stokers, the vessel made 16 knots (30 km/h) when it would normally have been pushed to make 14 knots (26 km/h). Wrexham arrived at Rotterdam with burnt funnels. The Great Eastern Railway presented Fryatt with a gold watch for this feat. The watch was inscribed Presented to Captain C. A. Fryatt by the chairman and Directors of the G.E Railway Company as a mark of their appreciation of his courage and skilful seamanship on March 2nd, 1915. Later that month he was in charge of Colchester when it was unsuccessfully attacked by a U-boat. On 28 March 1915, as captain of the SS Brussels, he was ordered to stop by U-33 when his ship was near the Maas lightvessel. Seeing the U-boat had surfaced to torpedo his ship, Fryatt ordered full steam ahead and proceeded to try to ram U-33, which was forced to crash dive. This action was in compliance with orders issued by Winston Churchill to captains of merchant ships. These orders included treating the crews of U-boats as felons and not as prisoners of war, in consideration of the German Empire's policy of unrestricted submarine warfare. White flags were to be ignored. Churchill's order also stated that survivors from U-boats might be shot if this was more convenient than taking them prisoner. If a captain were to surrender his ship he would be prosecuted by the British. The Germans became aware of these orders when they found a copy of them upon capturing the SS Ben Cruachan in October 1915. For this second action, Fryatt was awarded a gold watch by the Admiralty. The watch was inscribed Presented by the Lords Commissioners of the Admiralty to Chas. Algernon Fryatt Master of the S.S. 'Brussels' in recognition of the example set by that vessel when attacked by a German submarine on March 28th, 1915. Fryatt was presented with a certificate on vellum by the Lords Commissioners of the Admiralty. He was also praised in the House of Commons. On 25 June 1916, Brussels left Hoek van Holland bound for Harwich. Lights were shown from the beach and a flare was fired. A passenger is reported to have remained on deck and signalled to shore. Five German destroyers surrounded Brussels. The passengers were told to prepare to take to the lifeboats and orders were given for official papers to be destroyed, which was done successfully. Brussels was taken by the Germans, and the radio was destroyed. She was escorted into Zeebrugge and then to Bruges. Fryatt and his crew were sent to the civilian internment camp at Ruhleben, near Berlin. 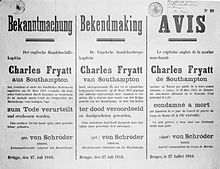 On 16 July 1916, it was reported in the Dutch newspaper De Telegraaf that Fryatt had been charged with sinking a German submarine. The Germans knew that U-33 had not been sunk. At the time of the trial she was on active service as part of the Constantinople Flotilla. The basis for the charge was the inscriptions on his watches. Fryatt was tried at a court-martial on 27 July 1916. The court-martial was held at Bruges Town Hall. He was found guilty of being a franc-tireur and sentenced to death. The sentence was confirmed by the Kaiser. At 19:00, Fryatt was executed by firing squad and was buried in a small cemetery just outside Bruges that the Germans used for burying Belgian "traitors". The grave was later visited by diplomat Sir Walter Townley (British Ambassador to the Netherlands from 1917 to 1919.) and his wife. 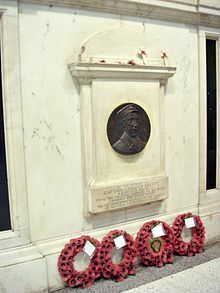 Memorial to Fryatt at Liverpool Street station. On 31 July 1916, British Prime Minister H. H. Asquith issued a statement in the House of Commons. I deeply regret to say that it appears to be true that Captain Fryatt has been murdered by the Germans. His Majesty's Government have heard with the utmost indignation of this atrocious crime against the laws of nations and the usages of war. Coming as it does contemporaneously with the lawless cruelty towards the population of Lille and other occupied districts of France, it shews that the German High Command, under the stress of military defeat, have renewed their policy of terrorism. It is impossible of course to conjecture to what atrocities they may proceed. His Majesty's Government desire to repeat emphatically their resolve that such crimes shall not, if they can help it, go unpunished. When the time arrives they are determined to bring to justice the criminals whoever they maybe and whatever position they may occupy. In such cases as these the authors of the system under which such crimes are committed may well be the most guilty of all. The question of what immediate action can be taken is engaging the earnest attention of the Government and I hope very soon to announce to the House of Commons what we can do. Lord Claud Hamilton, MP, Chairman of the Great Eastern Railway, denounced the execution as "sheer, brutal murder". The Mayor of Harwich opened a fund to erect a permanent memorial to Fryatt. A similar fund was opened in the Netherlands. In the United States, The New York Times denounced the execution as "a deliberate murder". The New York Herald called it "The crowning German atrocity". In the Netherlands, the Nieuwe Rotterdamsche Courant described the execution as "arbitrary and unjust", while the Handelsblad Holland called it "A cowardly murder inspired by hatred and revenge". In Switzerland, the Journal de Genève said "It is monstrous to maintain that armed forces have a right to murder civilians but that civilians are guilty of a crime in defending themselves". The Dutch branch of the League of Neutral States presented the Great Eastern Railway a memorial tablet which was erected at Liverpool Street station. The memorial was unveiled on 27 July 1917, exactly a year after Fryatt's execution. The scrap value of Brussels was donated towards the cost. The Great Eastern Railway awarded Fryatt's widow a pension of £250 per annum. The Government granted her an extra £100 per annum pension on top of her entitlement. Fryatt's insurers, the Provident Clerk's Association, paid the £300 that Mrs Fryatt was entitled to immediately, dispensing with the usual formalities. The Royal Merchant Seaman's Orphanage offered to educate two of Fryatt's seven children. The King expressed his indignation and abhorrence at the execution of Fryatt in a letter to Mrs Fryatt. 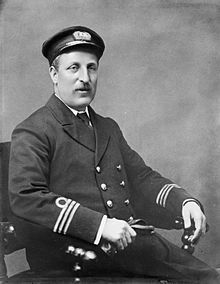 In the letter, he also wrote "The action of Captain Fryatt in defending his ship against the attack of an enemy submarine was a noble instance of the resource and self-reliance so characteristic of his profession." The incident inspired an Australian film, The Murder of Captain Fryatt (1917). The van in which Charles Fryatt's body was transported from Dover to London. Seen before restoration. In 1919, Fryatt's body was exhumed and returned to the United Kingdom for burial. His coffin was landed at Dover, and transported in South Eastern and Chatham Railway PMV No.132 to London. On 8 July 1919, his funeral was held at St Paul's Cathedral. Hundreds of merchant seamen and widows of merchant seamen and fishermen attended. Representing the Government were many members of the Admiralty, the Board of Trade, the Cabinet and the War Office. The band of the Great Eastern Railway, augmented by drummers from the Royal Marines, played the Dead March. "Eternal Father, Strong to Save" and "Abide with Me" were sung, and a blessing given by the Bishop of London. The route of the coffin to Liverpool Street station was lined with people. Fryatt was buried at All Saints' Church, Upper Dovercourt. His coffin was carried from the station to the church on a gun carriage. His widow was presented with the insignia of the Belgian Order of Leopold that had been posthumously awarded to Fryatt. Fryatt was also posthumously awarded the Belgian Maritime War Cross. In Zeebrugge there is a street named after Captain Fryatt, where he was held by the Germans. A wing at Dovercourt Cottage Hospital – which is now known as the Captain Fryatt Memorial Hospital. – was named in Fryatt's honour. A public house in nearby Parkeston is also named in Captain Fryatt's honour. In Canada, the 11,027 feet (3,361 m) high Mount Fryatt (52°33′00″N 117°54′35″W﻿ / ﻿52.55000°N 117.90972°W﻿ / 52.55000; -117.90972) was named in 1921 in honour of Captain Fryatt. The 10,317 feet (3,145 m) high Brussels Peak (51°31′00″N 117°49′20″W﻿ / ﻿51.51667°N 117.82222°W﻿ / 51.51667; -117.82222) was named in honour of his ship. In 2016, an exhibition was held at the Masonic Hall, Harwich to commemorate the 100th anniversary of his execution. The exhibition ran from 23 to 31 July. ^ a b c "Casualty Details: Fryatt, Charles Algernon". Commonwealth War Graves Commission. Retrieved 24 February 2018. ^ "Southampton's Capt Charles Fryatt remembered at IWM". BBC Hampshire & Isle of Wight. Retrieved 23 July 2012. ^ "1881 Census of the United Kingdom". The National Archives. Retrieved 19 December 2009. ^ Barton, George (2008). Celebrated Spies and Famous Mysteries of the Great War. BiblioBazaar. p. 115. ISBN 978-0-559-70829-9. ^ "School Speech Days. Lord Inchcape in H.M.S. Worcester". News. The Times (44646). London. 29 July 1927. col D, p. 14. ^ "Great Central Railway postcard of SS Wrexham leaving Grimsby Docks". Simplon Postcards. Retrieved 22 September 2010. ^ a b c d e "Captain Charles Fryatt". Great War Primary Documents Archive. Retrieved 8 December 2009. ^ "House of Commons Hansard; vol. 71, col. 698". Hansard. London: Parliament of the United Kingdom. 28 April 1915. Retrieved 19 December 2009. ^ Helgason, Guðmundur. "WWI U-boats: U 33". 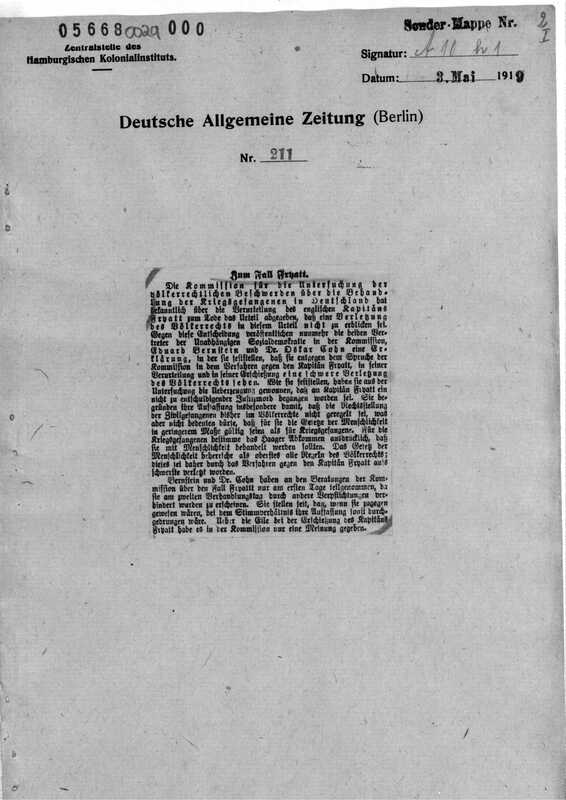 German and Austrian U-boats of World War I - Kaiserliche Marine - Uboat.net. Retrieved 19 December 2009. ^ "Previous Ambassadors". Foreign & Commonwealth Office. Retrieved 18 September 2010. ^ a b "British Government Statement on the Execution of Captain Fryatt, August 1916". First World War. Retrieved 10 December 2009. ^ "Remembering The Great War, London Part Two". Ray Westlake. Archived from the original on 31 August 2008. Retrieved 10 December 2009. ^ "Bid to save WWI heroes' carriage". BBC News Online. 3 December 2009. Retrieved 10 December 2009. ^ "Fryatts funeral". Brian Woods. Archived from the original on 17 May 2008. Retrieved 10 December 2009. ^ "Service to mark war hero's death". East Anglian Daily Times. Retrieved 10 December 2009. ^ "Captain Fryatt, Harwich, Essex". UKPubFinder. Archived from the original on 17 July 2011. Retrieved 27 April 2010. ^ "Mount Fryatt". Peakfinder. Retrieved 10 December 2009. ^ "Brussels Peak". Peakfinder. Archived from the original on 15 May 2011. Retrieved 10 December 2009. ^ "Charles Fryatt: The man executed for ramming a U-Boat". BBC News Online. Retrieved 26 July 2016. Wikimedia Commons has media related to Charles Fryatt. Wikisource has the text of a 1922 Encyclopædia Britannica article about Charles Fryatt. This page was last edited on 19 April 2019, at 17:20 (UTC).